If you stop using credit cards today and are barely making minimum payments, or falling behind it could take 20 or more years to get debt free. Depending on monthly payments and interest, some consumers will pay three times their current balance. In addition, continuing on the same path will have a negligible effect on your debt-to-income ratio. The truth is CCCS programs benefit the credit card companies by holding consumers into longer than expected programs, often lasting 5 to 7 years. CCCS companies are also able to entice consumers with in their programs under the guise of being a “non-profit” organization. Many CCCS companies charge hidden fees, sometimes referred to as donations, which can add up to many hundreds of dollars over time. Also, they do not negotiate on the principal balance, so you pay back more than what is owed. 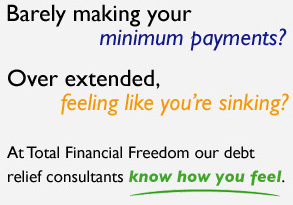 Many consumers who are suffering from being over-extended are also looking for immediate cash-flow relief. CCCS companies do not always offer consumers cash-flow relief. The result for many is a program that does not fit a tight budget and often lasts 2-3 years longer than a typical program at TFF. Finally, if you enroll with CCCS, their inquiry will be directly reported to your credit bureaus. When your credit report is obtained by a prospective lender or employer it can be determined that you sought out third party assistance. Bankruptcy might seem like the easiest solution, however, it should be the very last resort. Many consumers who have filed bankruptcy feel a sense of failure. Bankruptcy remains on a credit report for up to 10 years and will even become public record. In some communities local newspapers even publish names of people who recently filed bankruptcy! Chapter 7 Bankruptcy allows for a complete discharge of your debt. However, many are not eligible for this type of bankruptcy, which forces a Chapter 13. In this case, debts are not discharged, obligating you to a partial repayment, which could last for up to five years. Failure to meet the terms and conditions of a Chapter 13 could result in the liquidation of your home and other assets. This unfortunate decision will have long-term effects for many years to come. This could hinder your ability to obtain credit or find a new job depending on the employer and position applied for.